Teresa Holifield’s Kudzu Bloom Jelly is made from the bloom of the kudzu plant. The Soil Conservation Service promoted kudzu for erosion control in the 1930s. The common names for kudzu include: Mile-a-Minute Vine, Foot-a-Night Vine, and The Vine That Ate the South. The blooms have a sweet smell and look like a cluster of grapes. 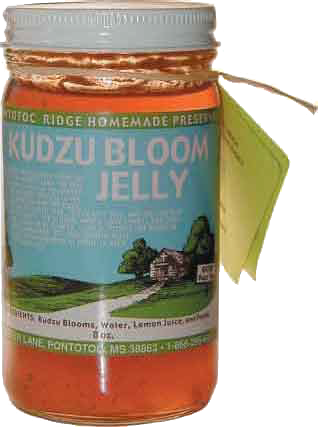 Kudzu Bloom Jelly is suggested with toast, bagels, and biscuits. Teresa compares the taste to crabapples. She hopes that you like her Kudzu Bloom Jelly, as she waded through snakes for you! The New Southern View advises against collecting kudzu for consumption in an unfamiliar place, as sometimes kudzu is treated with herbicides. And of course, never consume any plant or plant part that you have not confirmed to be edible by an expert.